The U.S. Air Force Band of the West's Freedom Brass will perform at 6 p.m. Friday, Sept. 9, in Cole Concert Hall on the SFA campus. NACOGDOCHES, Texas - The Freedom Brass ensemble of the U.S. Air Force Band of the West will perform at 6 p.m. Friday, Sept. 9, in Cole Concert Hall on the Stephen F. Austin State University campus. The concert is a presentation of the SFA College of Fine Arts and School of Music and is featured in this year's Cole Performing Arts Series. 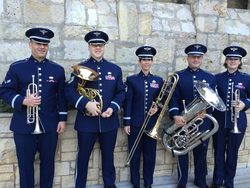 Freedom Brass is a brass quintet with percussion, which showcases military professionalism at Department of Defense ceremonies and public concerts throughout the Gulf Coast region on behalf of the U.S. Air Force. The ensemble is a component of the USAF Band of the West located at Joint Base San Antonio-Lackland, Texas, according to information at www.bandofthewest.af.mil. The USAF Band of the West has performed for presidents, heads of state and dignitaries from around the world earning an outstanding reputation among America's military bands. Cole Concert Hall is located in the Tom and Peggy Wright Music Building, 2210 Alumni Drive. Admission is free. For more information, call the SFA Fine Arts Box Office at (936) 468-6407 or visit www.finearts.sfasu.edu.